This week the advanced crosscut sawyers of the Okanogan-Wenatchee National Forest met along the banks of Icicle Creek. Officially, we were there to review our skills as well as the state of the crosscut saw program, and discuss the actions needed to keep such skills and program alive in the 21st century. Unofficially, it was the biggest trail crew campout I’ve been on. We sawed some logs and admired the shavings coming out of kerfs, ate together, told stories and laughed while the creek thundered through its precipitous gorge. For years we have tended trails through burned places, from the Methow Valley to the Yakima Indian Reservation, along Lake Chelan and deep into the Alpine Lakes Wilderness. 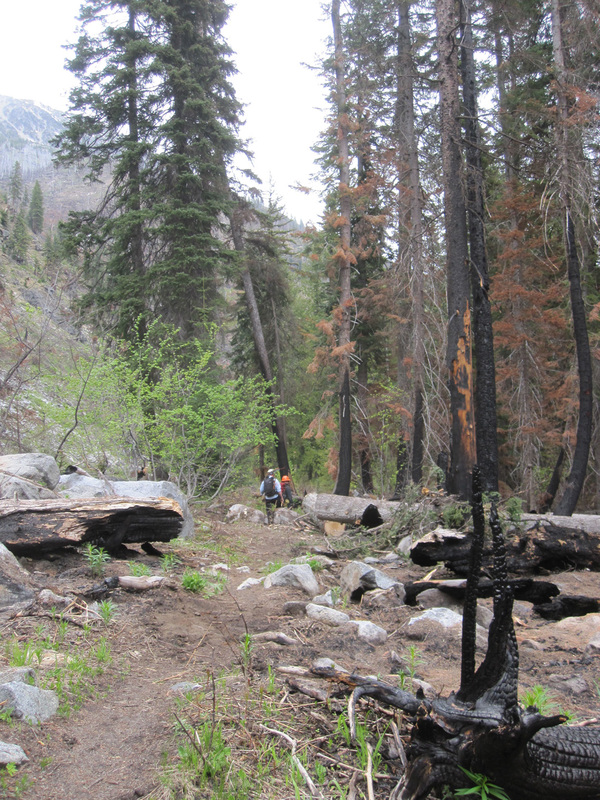 Trees killed by fire continue to drop for many years. The experience of hiking on these trails has been altered from a fairly stable forest environment to one that changes and grows as succession follows its course. For those of us who saw, working in a burned area adds a layer of complexity to our task. Trees are killed and weakened by the fire, and it’s hard to predict what factor might tip a tree in gravity’s favor. The slightest puff of wind on your back snaps your head up to look around. Escape routes are visualized and cleared before sawing starts. Where are you going to run if something comes loose? When it’s time to hike back to camp, pants are streaked black and faces are smeared with char. We are all the same, not minding the ash and charcoal. This is what we do. We are Dirt People, every one of us. So good to gather with others of our kind, and dedicate our summers to the way of the crosscut saw.